The picturesque villas and the bigger houses in the Wood suffered with the rest of London in the Blitz and came out of the War battered and run down. To do any decorating in 1946 it was necessary to obtain permission from the St Marylebone Borough Council to buy a pot of paint or a new bath. Most of the wrought-iron railings had been scrapped and were not renewable, many of the gardens given over to potatoes and the, now forgotten, Anderson air-raid shelters. The streets and pavements were neglected, water mains and gas repaired in a temporary fashion. Only the street lights, back at last, were a joyful sight after the long and dreary black-out. The lights, yes, but not the sodium lamps and concrete posts St Marylebone Council attempted to force on the people of St John’s Wood, in 1956. Two residents of Elm Tree Road, taking a stroll one evening, found their lips had turned black, and their cheeks a putrescent green; the woman’s red coat looked a khaki colour and the man’s blue tie a dirty grey. Beside the iron Victorian lamp-post outside their gate stood a thick concrete pole with its neck twisted like, a snake about to spit at its victim. 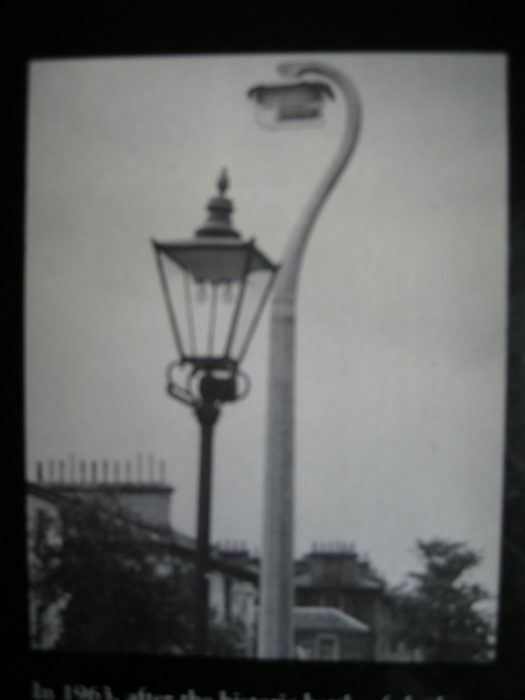 Modern street lighting had come to the Wood and the Council believed it was ‘good’ for the residents and ratepayers. They had made a mistake! A public meeting was called at the old (and now defunct) St John’s Wood Arts Club, where Onslow Ford and his friends had frolicked in the past, and the residents formed themselves into the St John’s Wood Preservation Society. Not since Babington had been on the run in the forest had such excitement been engendered. Doctors, lawyers, architects, writers and musicians pitted their wits against the Works Committee of the Council, to which it had never occurred that street furniture could be of any aesthetic importance. A petition was signed by 3,000 inhabitants, alternative schemes were put forward, and the battle was on. Public protest was not then a habit or even the political football it has since become. The residents were reasonable people, they loved their neighbourhood and, finally, after two years of incessant fighting, they were granted modern lighting that was more acceptable, if not ideal. In 1963, a new threat of insensitive development appeared when bulldozers moved into Loudoun Road and started destroying the good as well as the bomb-damaged houses on the west side. 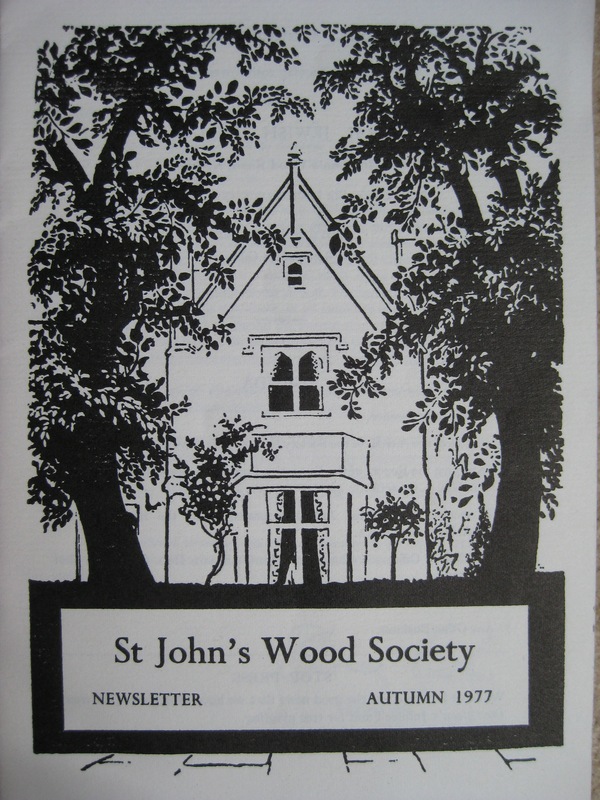 The St John’s Wood Society was reconstituted, with Stephen Potter as chairman and a committee of voluntary workers from amongst the residents was formed. Later, under the chairmanship of John Hawkes and Mrs Barbara Comerford, with the help of Geoffrey Hobbs and Miss Diana Wood, the Society was responsible for the designation of two large conservation areas, protected by the Civic Amenities Act 1967, which first introduced the concept of conservation areas. Tree preservation, planning applications, traffic control and all other matters concerning the environment are still monitored by the Society which, thanks to the honorary officers who devote so much time to it. The Society is now considered by the City of Westminster as a consultative body representing the view of the residents. Much has been achieved and vigilance continues as, indeed, it must, if St John’s Wood is to retain its character. After the destructive madness of the 1960s, the boom in property values has now led to the restoration, and, sometimes, over-restoration of anything that can be called ‘a period house’. In the end, it is the intimate scale of the villas, their elegance and oddity that make St John’s Wood so rare a neighbourhood in the undisciplined sprawl of London. In spite of the cars, the featureless flats and the supermarkets, a civilised air still blows in the side streets, where the lilacs and the pear trees bloom to enchant the eye and to recall a less neurotic age of love and the arts. (from St. John’s Wood – An Abode of Love and The Arts by Stella Margetson, author and late archivist for the Society). The Editor: The Society continues to play an active part in preserving the houses, landscape and the local amenities of this historic part of London. More information can be found by visiting the Society’s website.